James Martin has earned a bachelor of science degree in forensic chemistry, attaining a 3.91 GPA while participating in the Muriel A. Howard Honors Program and the Ronald E. McNair Scholars Program. Martin will receive the SUNY Chancellor’s Award for Student Excellence and the President’s Medal for Outstanding Undergraduate Student and deliver the student address during the 10:00 a.m. and 2:00 p.m. baccalaureate ceremonies at Buffalo State’s 143rd Commencement, Saturday, May 16, in the Sports Arena. A Ross B. Kenzie Family Presidential Scholar, Martin has an exemplary record of academic performance, is an involved and dedicated member of the campus community, and has a demonstrated record of excellence in leadership and creativity. He is keenly interested in pursuing a Ph.D. in chemistry or biology after graduation. Martin has participated in undergraduate research on and off campus. In 2013, he participated in the McNair Summer Research program, and in 2014, he participated in the Summer Research Opportunity program at Michigan State University. He has presented his research findings at numerous conferences and symposia, winning first place for undergraduate oral presentation at North Carolina A&T State University and the Best Presenter Award at Michigan State University. As a result of his academic prowess, the Chemistry Department honored him with the ACS Analytical Award and the Minority Student Award, and the Mathematics Department honored him for his outstanding achievement in calculus. In addition, he was presented with a Residence Life Award for Outstanding Academic Achievement and the Nurturing Initiative and Achievement (NIA) Program’s Mentor of the Year for 2014. 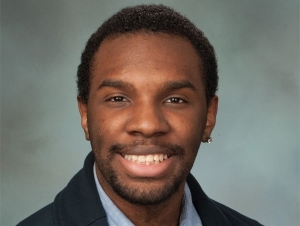 An intelligent, motivated, and committed member of the Buffalo State community, Martin has an impressive record of service to the campus and community that includes both participation in campus activities and working directly with fellow students. He is always willing to help others, formally tutoring EOP students in math and science and informally offering help to classmates who struggle with upper-level chemistry courses. He was a first-year mentor/resident assistant. He spoke to students at open houses, represented the honors program at the Scholarship Gala, and co-presented a workshop on research at Orientation. Off campus, he has volunteered his time with the Alternative Fall Break program and as a group leader for the PAL Summer Youth Employment program.